Buchanan High School is very fortunate to have a wide range of educational opportunities for our Special Education population. Everyone is different and we all learn in different settings. What Buchanan does is offer different programs that best match the needs of our students. Programs range from having teachers that just consult or check in on students to Special Day Classes where the students are in the same classroom with the same teacher the entire day. Each program is designed with the highest level of rigor possible for the students in that program, challenging them to learn at these high levels and expectations. Another wonderful thing about the Buchanan student population is the culture of embracing those around that might be a little different. Students in the Special Education population have case managers that work individually with the students and develop Individual Educational Plans that is custom designed for each student. Educational goals are set, some behavior goals could be set, it's really about what the student needs. Students are identified through a variety of observations, assessments, and conversations with teachers, parents, the student (that comprise the IEP team). Our students compete in Special Olympics competitions. They perform in our schoolwide talent show titled "Harmony" with our Leadership students. And we have a new sports competitive team for the CUSD titled "Clovis United". These teams will compete against our sister schools in both soccer and basketball. This new event is being launched this year with the anticipation of it growing to a larger scale. 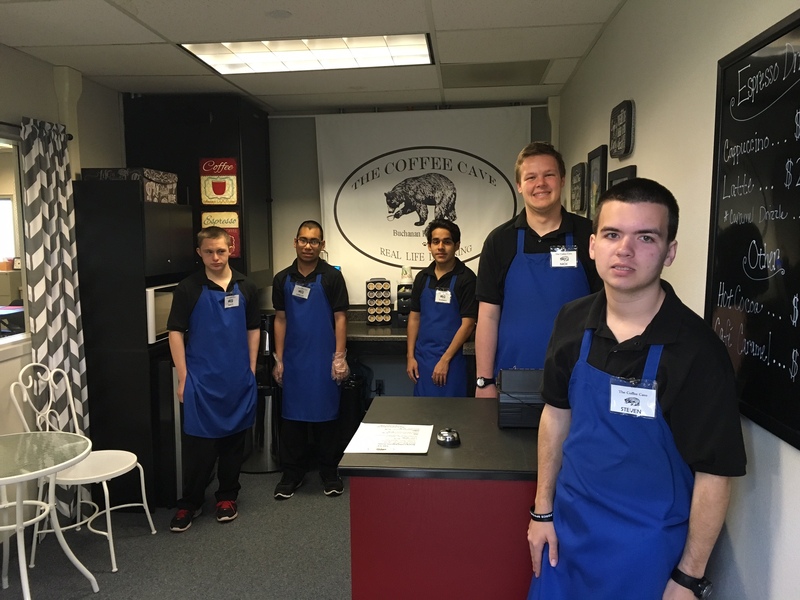 Our Functional Life Skills students run a small business titled "Coffee Cave". The students take orders and make specialty coffee drinks. They run the register and at times deliver the drinks to teachers on the Buchanan Campus. Students learn how to greet customers and other required skills that will help them secure employment once they leave Buchanan. This small business is a win win for all! Who are our Special Education Teachers? Stephanie attended Fresno State University where she obtained her B.A. degrees in Sign Language Interpreting and Deaf Education as well as her Education Specialist credential. She attended Chapman University where she obtained my Multiple Subject Teaching credential. Stephanie believes that all students can learn, each in their own way. She truly enjoys seeing students have their “AHA” moment and their enthusiasm for education ignite. Rich graduated from a small high school in northern California and then attended UCLA and the University of Phoenix where he received a Bachelor of Arts in Business Administration. After working in the private sector for many years he went back to school and received two teaching credentials and a Masters in Special Education. Rich decided to go into teaching because he has a desire to work with children and believes that all children can learn given the proper environment. This is his third year teaching at Buchanan High School. He is married and has 3 wonderful children. He have lived in the Fresno/Clovis area for the last 17 years and before that he lived in Los Angeles. Welcome to Buchannan! Karen has is in her 17th year of teaching, her first year at BHS. She teaches RSP Learning Center, and support in the classroom in English, Biology, and Health/Geography. She has a BA from Fresno State and a MA from Fresno Pacific. Karen has two active children- Isabella, a Sophomore here at BHS and Leyton, a 5th grader at St. Anthony’s. When she is not teaching, she's off with her children backpacking, snow skiing, or hanging out at one of our nearby lakes. Her teaching philosophy. Use and choose words wisely, she shares this with her students on a daily basis. Do your best, without question. Live your life with respect, treating everyone in your life with value and gratitude. Karen believes she owes this to all students, as well as the staff and community, to bring consistency, diligence, and warmth to her job in the hope that she can ultimately inspire and encourage such traits in others. Steve graduated from Clovis West High in 1987 and then attended Fresno City and Fresno State. Steve and his son conquer the world together. Their current goal is to visit every NFL stadium and watch the Philadelphia Eagles dominate!!!! (Seattle your next) This past summer the family truckster made it to Hawaii, Disneyland, and Avila Beach...When he's not teaching or coaching you can find him playing guitar somewhere. For the 2016-2017 school year he is teaching Accessing the Community, Health, and Everyday Life Skills for the Vocational Program as well as RSP support in Math 1, Economics/Govt., Health, and Geography. Steve runs the Guitar Club as the faculty director as well as the JV girls and boys golf coach. This is his 20th year teaching at Buchanan. Prior to that he taught for three years at Tarpey and one year at Garfield. Sarah Santini; is Puerto Rican and Italian. She's also bilingual. Sarah was born in Brooklyn, New York and grew up speaking English and Spanish. She believes her first language was Spanish as she was in Spanish classes until 3rd grade. Sarah moved to California when she was 9, due to her and 2 other siblings being adopted by their oldest sister. Prior to living in California, she lived in the projects with a foster family and 2 of her siblings. When she was 6 years old she was hit by a car, (that is why it is very important to look both ways before crossing the street!) followed by sleeping in a coma for 3 months. This was a defining moment in her life as she had to learn to walk and talk again. Having gone through these major setbacks as a kid, she feel extremely lucky and blessed to be where she is now. Her life quote: “ Laughter is the best medicine unless you’re really sick, then call 911” (not sure who wrote that, she saw it in a doctor’s office once). Sarah attended Chowchilla High School and participated in the Drama Club, Hispanic (Just Try) Club, and Girl Power Club, followed by graduating from California State University, Fresno with a Bachelor’s degree in Liberal studies and a credential in Special Education. She knew that she wanted to be a teacher when she was in the 8th grade. She realized that she wanted to work with students who have learning disabilities when she was in high school and was inspired by her nephew who has autism. Sarah is a Vocational Education Teacher and an RSP Case Manager at Buchanan High School. She teaches Vocational English 9/10, Customer Service 11/12, and Personal & Career Transitions. Sarah has worked at Buchanan High School for five years (including this year). She also worked at Washington Union High School as an SDC Teacher and RSP Case Manager for 1 year. Working in the Vocational Education Program is truly a blessing and passion of hers. Being able to work with our youth and help shape their lives in becoming responsible and knowledgeable adults really is so much fun for her. Sarah states that she could not imagine working in any other department!